My interest in finance began after a small business venture back in high school dealing with jewelry. I liked the idea of having strong cash flows and using them to grow my business. After competition came in and killed the margins I realized that I liked business but I wanted to learn how to perfect it. In college I got interested in Benjamin Graham's style of investing and his many disciples, including Warren Buffett. I read Security Analysis but my favorite book by Graham is The Intelligent Investor. I often find myself revisiting the 30+ pages of notes I took while reading it. I also enjoy researching newer value investors such as Allan Mecham. I look for companies with a strong moat and/or trading well below intrinsic value when considering long qualitative positions. I also have interests in econometric and statistical modeling for profit in the markets which can be used to fund the long positions. 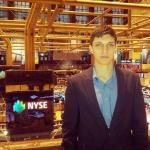 I have been to the NYSE with a full tour of the trading floor and upstairs offices. I also visited the Bloomberg LP building for training on the terminals. Outside of business my interests are in computer science and physics. One of the latest and most exciting developments to me is quantum computing. Another recent discovery that interests me is the idea of Behavioral Economics. This was sparked by reading Dan Ariely's Predictably Irrational.